Home > Blog > Barbie's garden > Did gardening in this heat! Hi my friend, I am finished! I spent the weekend cleaning my veggie patch – a host of weeds to clear out! Oh my word! 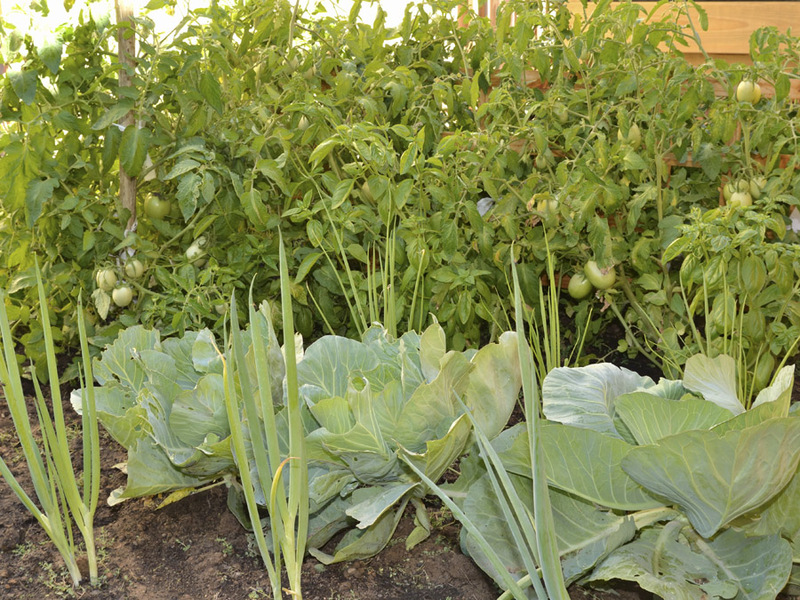 It was hot out here and my veggie patch is not a small one – 2m x 10m. I had to bring some order to what was growing in it. I had a butternut squash plant growing like a monster, but is was covered in powdery mildew and all the small squashes were stung by some kind of insect. It was so sad to pull it out. I need to read up on what to plant together with squash to prevent this from happening in the next planting season. 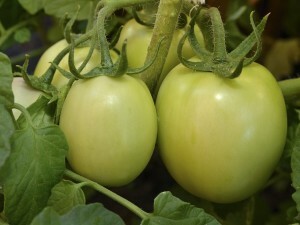 Any way, I have to say that my tomotoes are growing fantastically – I have sweet basil, onions, lemon thyme around the one section of tomatoes and these are growing out of control. The other patch it still small and has nothing planted nearby, so I have to say that companion planting is the way to go. Thank you Margaret Roberts – I love the book on Companion Planting and it has become my new gardening bible! This has been such a valuable gift – thank you Chris! I also have to admit that I can now go Nursery shopping with you – I have an excuse to fill all the extra space I have in the Veggie Patch! Hope you had a Happy Gardening weekend! 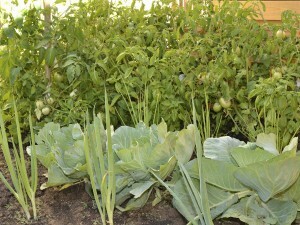 This is the best side of my veggie patch – the tomatoes are surrounded by Sweet Basil (you might not see this because of the huge tomatoes) then comes the Spring Onions then the Cabbage (the huge heads you see in the pic) then the Onions (in the foreground) – all companion planted to help each other grow better. Hi Barbie – Your veggies look AMAZING!! Wow! Is that cauliflower in front of the tomatoes? Looks fabulous! It was hot here too but fortunately, not unbearable, so I too spent quite a lot of time in the garden this weekend. Besides setting up the new Vegetable Planter, I also had lots of weeding to do, cutting back and I’ve started clearing that bed in the front – the one with the tree and mess of plants. Making a plan to change it completely! I was even felling the tree myself. Cut so much back because its so dark in that spot! Looking forward to transforming it!